let me show you the new setup. See now how the camera is mounted on the left hand side of the new mounting bar and the red dot finder is mounted on the right hand side. The really new feature is that now there are separate knobs, with 1/2-20 threads, that can be used to individually adjust and tighten either the camera or the red do finder, thus making alignment much easier. Now, I can move position the camera so that some distant object is centered in the Live View screen and then adjust the red dot finder so that the red dot lies right on top of the selected object. This is now so much easier that what I had before when both camera and red dot finder were attached to the tripod using just one, single 1/4 - 20 screw. 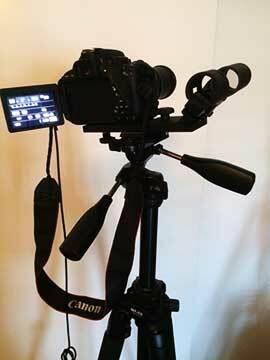 Ok, that is the new easy to use setup, now the target this time is the Crab Nebula (M1). Nothing special about selecting M1 as the target other than I don't think I have ever actually tried to look at it. 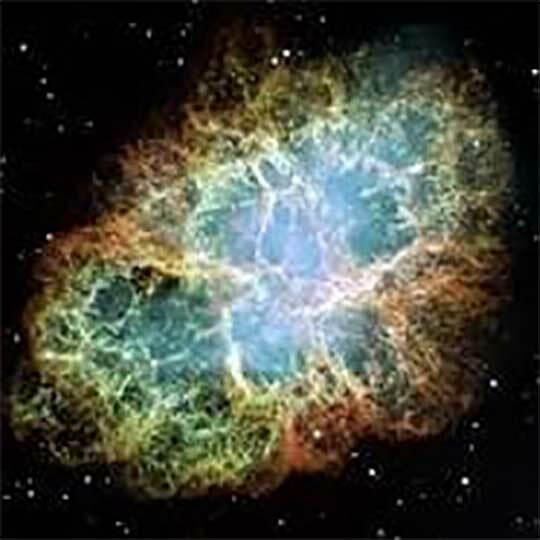 Last week Retired Semiconductor Physicist and OCA member, John, asked if I had seen the Crab Nebula, and darn, I couldn't really remember ever looking at it. Winter is a good time to see it, but we have been clouded out the last two months at Black Star Canyon, so, I thought I might as well just try and make an attempt at seeing it even in city lights. Just for convenience, see the beautiful image (courtesy of NASA) below. Now, I certainly don't expect to see anything like the quality of this image, nor of the quality of image that many of our OCA astroimagers get either, mainly after stacking many long exposure images. Anyway, we can dream about seeing something with our own eyeballs anyway. But will we be able to see M1 in city lights? This is a good time to review what is involved in being able to see dim, extended object like nebulas. Remember that extended objects, like nebulas, appear much dimmer that one might expect based on just their apparent magnitude. 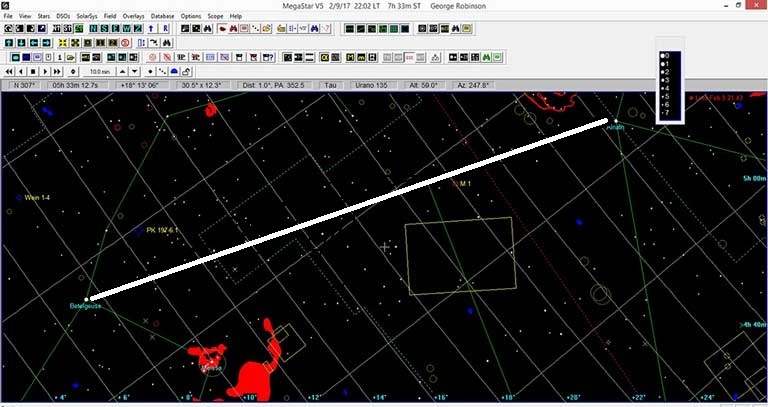 M1 has apparent magnitude = 8.4, but this light is spread over an area of the sky almost 7 arc minutes in diameter, which is many thousands of time larger than the image of a star of similar magnitude. So it you were to take all the photons reaching us from the star and spread them out over the area of the sky associated with M1, the light intensity on the camera pixels will be much, much less and might even be so dim that the night sky could be brighter. So how do we tell how bright the night sky is? Experienced amateurs will all have their own approach to this problem and usually rely on how many stars of various magnitudes can be seen with the naked eye. The approach used here is to make an actual measurement of the night sky brightness with an IPhone app, Dark Sky Meter, which was first brought to my attention by Moved to Dark Mountainous Skies, David. Thanks for the tip, David! 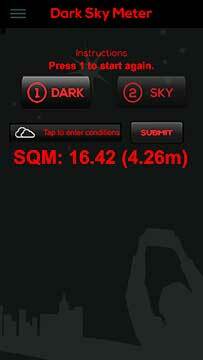 The screenshot image, below, shows the measured dark sky, taken by just stepping outside the observatory. The sky was cloudy, the street lamps and house lights were all on, and the moon was almost full, all of which contribute to bright city lights view. Now if I interpret the measurement correctly, the SQM=16.42 corresponds to 16.42 magnitude per square arc second. So how bright is M1 compared to this night sky brightness. Well, we can calculate the surface brightness of an extended object, which is SB = apparent magnitude of object + 2.5 * log (Area of the object in square arc seconds). So, if we assume M1 is circular, we can estimate the SB = 8.4 + 12.9 = 21.4. Oh, oh, this M1 surface brightness is much dimmer than the measured night sky brightness, so based on this estimate it is not likely that we will be able to see M1 in these bright city light views. But, I wonder if this estimate is strictly correct or not? The near full moon and street lights certainly contribute to making the measured value as bright as it is and it is certainly not conducive to getting your eyeballs accommodated to the dark skies. But, I am not interested in getting my eyeballs accommodated this time because I am taking a photograph and don't really care what my eyeballs say, other than that I can find the reference stars such that I can point the camera in the right direction. Also, I can see the overhead clouds, so this leads to believe that they are visible due to the reflected light from the city lights, etc., on the ground and reflected light from the moon. But my camera is pointing at a relatively dark spot on the sky and should not receive much light from the clouds, etc. Also, the Dark Sky Monitor is measuring the light from all of these objects, the bright moon and ground lights reflected back down by the overhead clouds, so, if I am correct in reasoning so far, my camera and telephoto lens will not see a big part of the night sky light that will obviously affect my eyeballs and dark sky monitor. So, maybe, just maybe, we still might be able to get a bit of a glimpse of M1. So, outside I go and try to find M1. Now, I can't see M1 because it is too dim, but I found that M1 lies almost directly on a line going from Betelgeuse, magnitude 0.4, in Orion and one other dimmer star, Elnath, magnitude 1.6. See the chart view below. The camera field of view for 300mm focal length is 2.9 degrees by 4.4 degrees. Now, I could just barely, and on just an occasion here and there, see Elath, because of clouds, but I tried to guess where M1 was based on going down the line from Betelgeuse, which I could always see. But, as luck would have it, my guess and aim was off a bit. The camera field of view is shown as a white rectangle in the screenshot and M1 is located just below the thick white line. Alas, the location where the camera is pointing, as identified with the image analysis of Astrometry.net, shows that my pointing was not good enough to include the location of M1 in the field of view. I was off by just one camera frame of view. Darn! That is just what happens in the world of astronomy. The clouds were coming in even heavier, which started out at about 65% overcast, and now it was getting hard to even see any bright stars, so I just brought everything back inside. So, the answer to the question of being able to see M1 in city lights views remains unanswered by this investigation. Normally, for dim objects, one can just increase the exposure time, but this can't be done here for two reasons. First any exposure time greater than about 2 seconds with my non-tracking mount will have streaking and trailing in the image and I would have to use the tracking mount to go to longer exposures. Secondly, and most importantly, if the target is dimmer than the background night sky, there is not much chance of seeing anything in that the object will be completely washed out. Oh, well, that is about enough on this topic, even though I will try this experiment again later after the current rain clouds go away. If you want to read up more on surface brightness and such topics, check out the Cloudy Nights web page by clicking on the web reference on the blog main page. Reading some of the comments there leads me to believe that many of these estimates of darkness and naked eye observing limits should be taken with a grain of salt. Check it out. In fact, I intend to finish off the afternoon with a whole lot of grains of salt on my margarita(s).